Subject(s): Discipling (Christianity) and Religious. Many churchgoers complain that their churches lack a coherent plan for discipleship and spiritual growth. In turn, many church leaders lament their lack of resources to build and manage effective programs to help people become fully devoted followers of Christ. 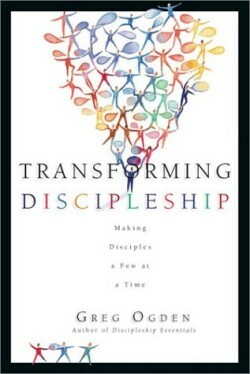 In Transforming Discipleship, Greg Odgen introduces his vision for discipleship, emphasizing that solutions will not be found in large-scale, finely-tuned, resource-heavy programs. Instead, Ogden recovers Jesus’ method of accomplishing life change by investing in just a few people at a time. And he shows how discipleship can become a self-replicating process with ongoing impact from generation to generation. Biblical, practical and tremendously effective, Transforming Discipleshipprovides the insights and philosophy of ministry behind Ogden’s earlier work,Discipleship Essentials. Together, these ground-breaking books have the potential to transform how your church transforms the lives of its people. Copyright © 2019 Presbytery of Ohio Valley. All Rights Reserved.